We’re delighted to officially invite you to our 2018 Portfolio Showcase at Chico Hot Springs Resort in Montana. We can’t wait to meet you and spend the week learning, talking shop, and collectively upping our visual game in Big Sky Country. In the coming weeks, we’ll be in touch with a packet of all the info you need to know in advance of attending the showcase. In the meantime, your deposit of $1,225 (50% of tuition) is due by Monday, January 29, with the balance due one month later on February 26. Of course, you’re also welcome to pay in full right away. After you have selected your tuition payment, please choose your accommodation preference and add them to your cart as well. Rooms are assigned on a first-come-first-serve basis. If you have questions or special requests regarding shared accommodations, please email us at support@collectivequarterly.com, and we'll respond promptly. Tuition includes lectures, portfolio reviews, and food. The final balance is due by Monday, February 26. Shared rooms with dorm-style bathrooms are located in the Main Lodge, a three-story inn that houses Chico's famous Dining Room and Cocktail Lounge. It adjoins Warren's Wing and is connected to the hot springs pool from the second floor, with easy access to the saloon. The rooms in the Main Lodge are quaint and cozy, furnished primarily with antiques. Most Main Lodge rooms have one or two full-size beds, however there are some queen and twin-sized beds throughout the building. As shared lodging is first-come-first-served, we can not guarantee bed type. But we promise you'll be comfortable! Shared rooms with private bathrooms are scattered throughout the Main Lodge, Warren's Wing, Lower Lodge, and Small Rustic Cabins. Each offers easy access to the dining room, cocktail lounge, saloon, and hot springs—as well as the conference center where we'll be meeting. Rooms throughout the resort are simple but well appointed with classic Montana decor. Most rooms have one or two full-sized beds, however there are some queen and twin-sized beds depending on the location. As this is shared lodging, we can not guarantee bed type. But we promise you'll be comfortable! Private rooms with dorm-style bathrooms are located in the Main Lodge, a three-story inn that houses Chico's famous Dining Room and Cocktail Lounge. It adjoins Warren's Wing and is connected to the hot springs pool from the second floor, with easy access to the saloon. Rooms throughout the resort are simple but well appointed with classic Montana decor. All rooms are non-smoking, have private bathrooms, internet access, coffee pots, hair dryers, irons and ironing boards. These rooms are for those seeking a little extra privacy and a secluded place to crash after busy days spent in lectures, reviews, and talking shop. Private rooms with private bathrooms are available throughout the Main Lodge, Warren's Wing, Lower Lodge, Fisherman's Lodge, Small Rustic Cabins, and One-Room Cottages. Each offers easy access to the dining room, cocktail lounge, saloon, and hot springs. These rooms are for those seeking extra privacy and a secluded place to crash after busy days spent in lectures, reviews, and talking shop. You're all set! click below to proceed. By registering above, you understand that you are entering your photography portfolio into consideration for a portfolio showcase hosted by The Collective Quarterly at Chico Hot Springs Resort in Pray, Montana. 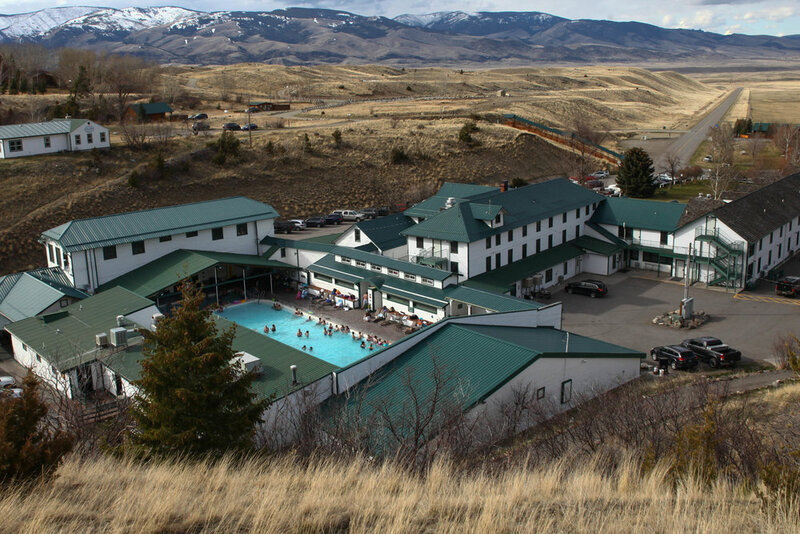 The registration fee of $2,450 covers lectures, meals, and portfolio reviews at Chico Hot Springs Resort, but you are responsible for your travel to and from the seminar. Upon acceptance, we will collect an additional fee for the accommodations you choose and book lodging on your behalf. The Collective Quarterly will review all portfolios and offer invitations based on merit. Sunday (3/25) and Friday (3/30) are considered arrival and departure days. Lectures, panel discussions, and reviews will take place starting Monday, concluding Thursday. The Collective Quarterly will provide three meals per day Monday through Thursday. The $28 application fee is non-refundable but will count toward your total payment if selected. The tuition fee for the workshop is $2,450. If selected, a 50% deposit of $1,225 is due by Monday, January 29, with the remaining $1,197 due on Monday, February 26. All fees are non-refundable. However, in the unlikely event that The Collective Quarterly cancels or reschedules the Event, The Collective Quarterly will make a reasonable effort to notify you and, if necessary, reimburse the full registration fee. The Collective Quarterly is not responsible for reimbursing travel expenses if the Event is canceled. This is a premier event that includes lectures, reviews, and meals across four days with seven keynote speakers and 11 additional reviers—all nationally and internationally recognized. We're also pleased to act as a consierge, pairing attendees with a range of lodging options that will work for every budget. Having surveyed the plethora of photography workshops out there, we wanted to put together our own original event that takes care of all of the pesky details so our attendees can focus exclusively on honing their work and maximizing time with some of the best minds in the field of photography. IT FEELS LIKE A BIG INVESTMENT. We believe your career is worth investing in. Portfolios get you in the door (so let’s take yours to the next level). But even when you’re in the door, our industry is built on personal relationships (so let us introduce you to the decision-makers you should know). We believe that we can help our audience and creative community find sustainable creative work. And if we succeed, we'll have an even better community to work with. WHO WILL BE REVIEWING MY PORTFOLIO? That’s the beauty of this workshop: Attendees will get reviews from the keynote speakers as well as a mix of additional reviewers with the highest credentials. Attendees will get a 25- to 30-minute session with eight reviewers over the course of the event. WHAT KIND OF LECTURES WILL THE SPEAKERS BE GIVING? There will also be Q&A sessions with the panel as a whole, allowing a third avenue to get specific questions answered outside of your eight review sessions. WILL THERE BE TIME TO INTERACT WITH THE SPEAKERS OUTSIDE OF THEIR LECTURES? Our speakers will be around for the entire five days, with ample time to chat and connect during the off time around the resort. Eighteen total professionals is a high ratio of reviewers to attendess—and we imagine that many of our attendees will want to go to Livingston, Yellowstone National Park, or just shoot around. If you want extra time and are proactive, we're confident that you’ll get as much as you want. HOW MUCH OF THE FOCUS IS EDITORIAL VS. COMMERCIAL VS. FINE ART? We’ll be representing all three equally. In our experience, editorial gives you flexibility when experimenting with style, funding personal projects, and gaining legitimacy in your artistic voice when it comes to more serious endeavors like art books, gallery shows, etc. It also allows for a second or even third life to your work, if know how to leverage the appropriate usage rights. While commercial work pays more, you also have to give up more of your creative control. That being said, it is of course an essential part of making a living as a visual artist and we’ll be delving into how to combine the two so that you can achieve the best of both worlds by earning a substantial living while also having the freedom to explore and grow as a storyteller.